As many of you know, I partner with Kingsford® as a "VIP Blogger" on their Grilling.com site. Well, they need your help in trying to help save tailgating from increasingly strict and restrictive stadium rules. Stadium parking lots shall be open for all tailgaters at least 24 hours before kick-off. Anyone with a passion for football or grilling shall be allowed to tailgate in the stadium parking lot, not just fans with tickets to the game. Fans can always bring their own grills to the stadium, preferably ones that use charcoal. Each tailgate spot should be allowed to have a table and tent as long as you bring enough grub to share with neighbors. Tailgating tunes can (and should!) be played. Tailgaters shall be allowed to bring a cooler of food and cold beverages to the parking lot to enjoy before heading into the stadium. Fans shall have the right to tailgate in a friendly and safe environment, hanging out with fellow fans no matter what team they’re rooting for. Once 10,000 signatures are collected, the makers of Kingsford® charcoal will present the Tailgater Bill of Rights to the professional football commissioner as well as the management teams of pro and college football stadiums across the country in an effort to persuade them to save the all-American tradition. 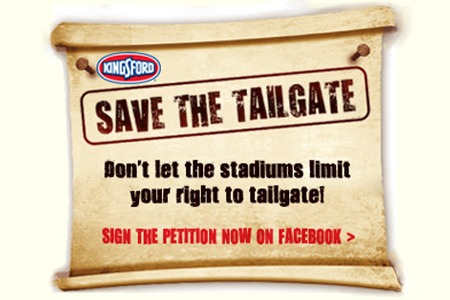 You can read much more about this effort at the Kingsford® Save The Tailgate site. There you can also learn about their ongoing partnership with ESPN and some really cool giveaways in conjunction with Grilling.com. I encourage you to go take a look at all of the great recipes, information and fun stuff that's cookin' over there.